I’m pleased to announce my new release, FROM NOW ON. 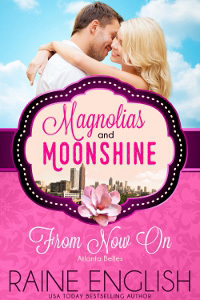 It’s part of the fabulous Magnolias and Moonshine series. Twenty New York Times, USA Today, and Amazon bestselling authors joined together to bring you a taste of Southern charm. FROM NOW ON is available at the following retailers for just $0.99! Wonderful, Raine! Looks like a great read. Looks like a great story, Raine. Congrats on the new release. Reunion stories are my favorite!